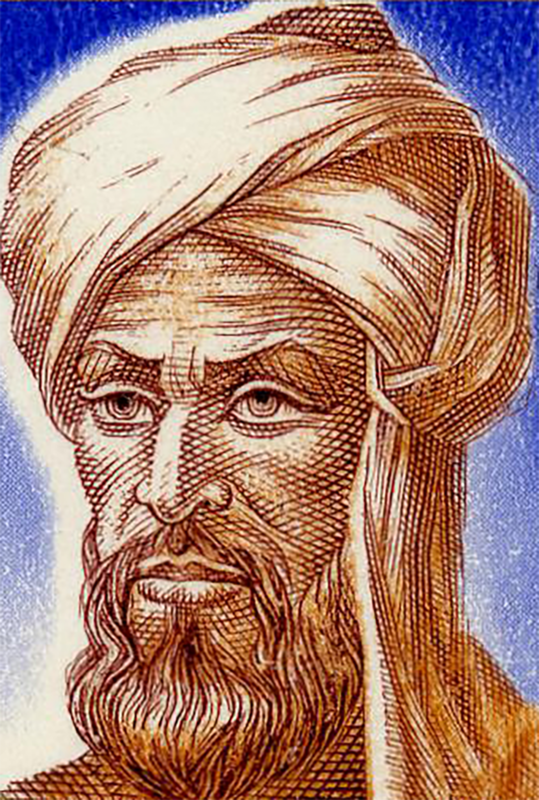 Sometime in the early 9th century, a Persian mathematician named Muhammad ibn Musa al-Khwarizmi (circa A.D. 780–850) gained a key piece of knowledge that would eventually earn him the nickname “the Father of Algebra.” What he discovered would also speed up mathematical calculation many times over and, eventually, make a host of amazing technological advances possible, up to and including cars, computers, space travel, and robots. What was it? The Hindu number system (developed in India). The system intrigued al-Khwarizmi because it used nine different symbols to represent numbers, plus a small circle around empty space to represent shunya—“nothingness.” To keep from having to use more and more symbols for larger numbers, the Hindu system was a place system. The value of a number could be determined by its place in a row of numbers: There was a row for 1s, a row for 10s, 100s, 1000s, and so on. If nine numerals and a circle to represent “nothing” sounds familiar, it should. Thanks to al-Khwarizmi, the Hindu number system (known in the West as “Arabic numerals”) is the system used in most of the world today. Al-Khwarizmi knew a good idea when he saw one. He was a scholar and worked in the House of Wisdom, a combination library, university, research lab, and translation service in Baghdad. At the time, the Abbassid caliphs—who claimed to be descendants of Abbas, the prophet Muhammad’s youngest uncle—ruled the Persian Empire. They had turned their seat of power, Baghdad, into the “jewel of the world.” Muhammad had exhorted his followers to “acquire knowledge” and to “seek learning though it be as far as China.” So as Europe descended into the Dark Ages, the caliphs kept the light of knowledge burning bright. They collected as much of the world’s written knowledge as they could get their hands on and had it translated into Arabic. At a time when the largest library in Europe contained far fewer than a thousand volumes, the Abbasids amassed a library believed to have held a million books. “The tenth figure in the shape of a circle,” al-Khwarizmi wrote, would help prevent confusion when it came to balancing household accounts or parceling out a widow’s dowry. The circle was the key: If no numeral fell into a particular column, the circle served as a placeholder, as al-Khwarizmi put it, “to keep the rows straight.” A merchant (or mathematician) could run his finger down each column starting from the right and be confident that the 1s, 10s, 100s, and so on, were in the correct place. The invention of sunya (zero) liberated the human intellect from the prison bars of the counting frame. Once there was a sign for the empty column, ‘carrying over’ on a slate or paper was just as easy as carrying over on the abacus…and it could stretch as far as necessary in either direction. That, in a nutshell, is the humble beginning of zero. But a circle used as a placeholder is only half of the story about nothing. For awhile, the Hindu circle remained a placeholder doing nothing more than showing that there was nothing in a particular column. But al-Khwarizmi wasn’t content with that and went back to the books. He studied everything he could find about math from the ancient Greeks and others, and he began considering the existence of negative numbers, in particular what happens when you subtract a larger number from a smaller one. 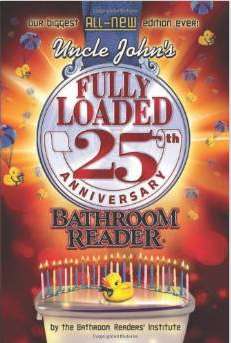 Something about the available literature bugged him. There was something missing. Take a problem like 3 – 4 =___. Everybody had figured out that the answer was -1. But al-Khwarizmi knew that he couldn’t arrive at that answer by starting at 3 and counting backward by 4 numbers. When he did that…2, 1, -1, -2…the fourth number was -2, and that’s the wrong answer. Around A.D. 825, al-Khwarizmi wrote a book to explain calculation using the Hindu number system. It was called, fittingly, On the Calculation with Hindu Numerals. 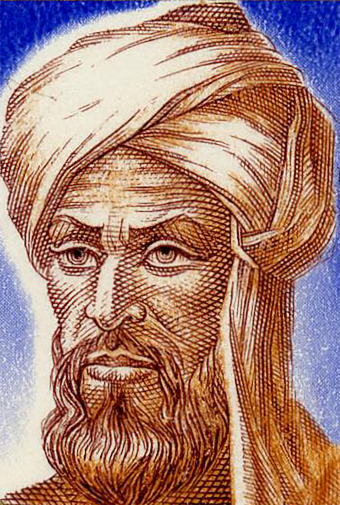 But al-Khwarizmi didn’t rest on his zeroes; he expanded his work, developing math that included rational and irrational numbers, negatives, equations, and all the other stuff you’ve forgotten from ninth grade. …what is easiest and most useful in arithmetic, such as men constantly require in cases of inheritance, legacies, partition, lawsuits, and trade, and in all their dealings with one another, or where the measuring of lands, the digging of canals, geometrical computation, and other objects of various sorts and kinds are concerned. Al-Khwarizmi’s books became popular throughout the Persian Empire, and not just with mathematicians. Storekeepers, bankers, builders, architects, and anyone else who needed math to do their jobs made use of Hindu numbers and al-Khwarizmi’s algebra. But it would take a surprisingly long time before his concepts spread beyond the Muslim world and into Europe. During the Middle Ages, much of the Christian world considered Muslims to be “heretics” who rejected the “true faith.” What, then, could be learned from them? In the minds of most Europeans, the answer was an unequivocal “nothing.” When it came to math, there was one notable exception: the 10th-century French monk, Gerbert of Aurillac. As a young monk, Gerbert had traveled to Muslim-controlled Spain to study advanced science, astronomy, and mathematics—disciplines that had been virtually lost to the Western world. He discovered “Arabic numerals,” learned how to use an abacus, and studied algebra. Gerbert couldn’t wait to get back and share this knowledge. One man in particular was interested: Otto the Great, the Holy Roman Emperor. Otto took 20-year-old Gerbert into his court to tutor his 16-year-old heir, Otto II, in what was then called “mathesis.” Otto II wasn’t much of a scholar, but he knew a good teacher when he saw one. When his own heir, Otto III, needed a tutor, Gerbert was his man. Over time Gerbert became an astronomer, organ builder, music theoretician, mathematician, philosopher, teacher, and…the world’s first French pope—Sylvester II. In 999 Otto III, in his new role as emperor of the Holy Roman Empire, used his influence to get his former teacher elected to the papacy. Gerbert saw his election as an opportunity to introduce Arabic numerals into the Church, replacing those unwieldy Roman numerals. Bad idea: Using Arabian “squiggles” to do math was, to many, a suspicious indication that Sylvester II had gone over to the dark side. Rumors spread that while in Spain the future pope had either learned the “magic” we call math from his teacher’s secret book of magic…or studied with the Devil himself. Arabic numerals (and zero) made their next significant appearance in Western civilization nearly 200 years after Gerbert’s death, courtesy of Leonardo Fibonacci. Born in Pisa to a wealthy Italian merchant around 1170, Fibonacci is said to have been the best Western mathematician of the Middle Ages (not that he had a lot of competition). Leonardo was raised in northern Africa where his father oversaw Italy’s coastal trading outposts and made sure his son was schooled in the math he would need to become an accountant. His Arab teachers showed him al-Khwarizmi’s Hindu-Arabic number system. “When I had been introduced to the art of the Indians’ nine symbols, knowledge of the art very soon pleased me above all else,” he later wrote. As a young man, Fibonacci traveled enough to encounter other number systems being used in the West, including the awkward Roman numeral system still reigning in Europe. (He also traveled enough to earn the nickname Bigollo, which means “vagabond” or “wanderer.”) To Fibonacci, the Hindu-Arabic system he’d learned in the Arab world was far superior. He returned to Pisa as an adult and, in 1202, published Liber Abaci (Book of Calculation) to share the knowledge of how to use the Hindu-Arabic system in practical ways, including the conversion of measures and currency, allocation of profit, and the computation of interest. Italian merchants and bankers loved it. Soon most of them had switched over to the new system. That didn’t end the push back against Arabic numerals. In 1259 an edict came from Florence forbidding bankers to use “the infidel symbols,” and in 1348 the University of Padua insisted that book prices be listed using “plain” letters (Roman numerals), not “ciphers” (al-Khwarizmi’s sifr). Though Fibonacci’s book is credited with bringing the zero (as well as its buddies, 1 to 9) to Europe, it took another 300 years for the system to spread beyond Italy. Why? For one thing, Fibonacci lived in the days before printing, so his books were hand written. If someone wanted a copy, it had to be copied by hand. In time, Fibonacci’s book would be translated, plagiarized, and used as inspiration for books in many other languages. The first one in English was The Crafte of Nombrynge, published around 1350. Lest we forget, advanced knowledge also developed in the New World independently of Old World thought. The zero appears on a Mayan stela (a stone monument) carved sometime between 292 and A.D. 372. That’s about 500 years before al-Khwarizmi “discovered” it. The Babylonians had them thousands of years before. I believe the real great Indian innovation was in treating zero as a number rather than just a place-holder. It looks like you have rows and columns transposed throughout the article. For example, you can’t run your finger across a column from right to left, you do that to a row. Rows are horizontal and columns are vertical. Furthermore, numbers are written in rows, from the one’s place in the center and ascending going left, descending going right. The places, then, are columns. The one’s column, the ten’s column, and so on. I feel this article gives way more credit to Al-Khwarizmi. He might’ve been intelligent, but I suspect he mainly just translated the Indian work. The middle-East only acted as a bridge between India and Europe during the Dark Age, and I doubt these translators gave much, if any, credit to the source. This article seems more about the journey of ‘0’ from India to the West, than the origin of it. An article on ‘0’, and no mention of the Indian who invented it? “The rules governing the use of zero appeared for the first time in the Brahmasputha Siddhanta (7th century, written by Brahmagupta). This work considers not only zero, but negative numbers, and the algebraic rules for the elementary operations of arithmetic with such numbers. In some instances, his rules differ from the modern standard, specifically the definition of the value of zero divided by zero as zero.” – Algebra with Arithmetic of Brahmagupta and Bhaskara, translated to English by Henry Thomas Colebrooke (1817) London. This is in strict contradiction to the fact that Al-Khwarizmi identified ‘0’ as a numeral, or that he developed negative integers. And even though the modern algebra might’ve been named on one of his works, it had been developed and was being studied as a branch of mathematics, probably way before his birth. His “eureka moment” was most probably him understanding the text he was translating from. I feel that this article needs to be edited, or even replaced to tell the true story of zero. Also, you should post articles from more serious sources than “Uncle John’s Bathroom Reader”, specially on scientific topics such as these. true, should be mentioned ‘Aryabhatta’ in the article who invented the Zero. I don’t really agree on this one. -2 may be wrong answer for today standards and modern rules, but it would be perfectly acceptable in a system missing the 0. We could just adjust the mathematical rule to something like: every operation which the results is under 1 must be increased by unity and inversely, every operation under 1 which the result is over 1 must be decreased by a unity. And a special addendum we could add NULL as results which falls between 1 and -1. Just think about it, the octal system is in fact more complex because it lacks not only one number, but two: 8 and 9. Still it’s widely used in computing.